Was Scotland’s national poet really just ‘an Ayrshire peasant, with a peasant’s taste for what was fiery and instant’? He was certainly unafraid of praising whisky in his work – not to mention delving into whisky politics. Gavin D Smith reports. Robert Burns may have started life as a simple farmer's son, but he has become one of the greatest icons of Scottish culture. All over the world on 25 January, people gather to commemorate the birth in 1759 of Scotland’s national poet, Robert Burns. As much celebrated in Asia as he is in his native Ayrshire, it is sometimes difficult to separate the myth from the man – and to reconcile the bard’s many contradictions. The Alloway-born poet and songwriter is sometimes presented as a semi-literate ploughman who just happened to be able to put his thoughts down on paper in a poetic style, but he was, in fact, relatively well-educated and well-read, despite his father, William, being a comparatively unsuccessful farmer. A passionate advocate of freedom and independence, and an ardent supporter of the French Revolution, Burns nevertheless numbered many titled people among his acquaintances. From 1789 until his untimely death from rheumatic fever on 21 July 1796 he served as that ultimate symbol of authority and order – an excise officer, based in the town of Dumfries. ‘Inspiring bold John Barleycorn [whisky]! According to legend, Burns was introduced to whisky at the age of 22, when he was an apprentice in the flax-dressing trade in the Ayrshire town of Irvine, prior to taking up farming for a living. Sometimes, Scotland’s national drink receives a relatively casual mention in his writing, as in The Jolly Beggars (1785), where Burns refers to the whisky from a specific distillery, namely ‘...dear Kilbagie’. The poem was inspired by a visit made by Burns and a friend to Poosie Nansie’s Tavern in Mauchline. The tavern catered for a less refined clientele – hence the fact that Kilbagie whisky was a favourite drink there. At the time, Kilbagie distillery, situated at Kincardine, close to the River Forth, distilled spirit in shallow stills which could be run off in a matter of minutes, and the ‘make’ was renowned for its harshness. Much was exported to England and rectified into gin. This seems unfair, as Burns elsewhere describes Lowland whisky from the overworked stills of Kilbagie, Kennetpans and the like as ‘...rascally liquor’ and, in his poem Scotch Drink, refers to English brandy as ‘...burning trash’. As well as making occasional references to the spirit, Burns wrote a number of poems which take Scotch whisky as their central theme, the first being John Barleycorn (1782), which uses personification in referring to the processes of reaping and malting the barley and subsequently distilling it. As in Burns’ reference to whisky in Tam O’Shanter, there is a clear message that whisky invokes a sense of bravery. ‘Twill make your courage rise. 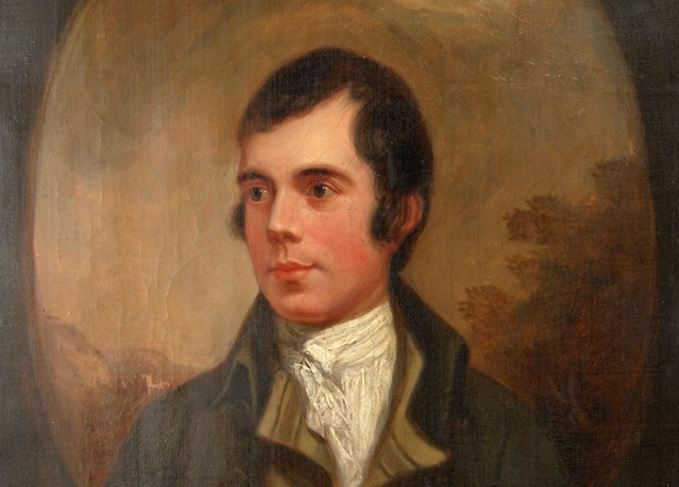 Burns went on to compose two altogether more ‘political’ whisky poems, both of which were inspired by perceived injustices towards Scotland’s interests and her people. Scotch Drink was written during the winter of 1785/6, the year after new excise legislation in the form of the Wash Act had ended the exemption of duty payments enjoyed by the Protestant Forbes family’s Ferintosh distilleries in Ross-shire. Forbes’ estates had been badly damaged during the Jacobite rising of 1688 in support of the Catholic James III and, by way of compensation, the Scottish Parliament granted Forbes the right to distil whisky without payment of duty in perpetuity, in return for the sum of 400 Scots marks per year. Not surprisingly, the Forbes family became very wealthy during the following century. The Wash Act led to them being awarded £21,580 in compensation, but Robert Burns was outraged by the loss of the Ferintosh ‘privilege’, and was moved to put pen to paper on the subject. ‘O thou, my Muse! guid auld Scotch drink! Ultimately, however, the poem shifts from being a celebration of Scotch whisky to tackle the Ferintosh situation, and the apparently repressive nature of prevailing excise legislation, perceived by the writer as anti-Scots, anti-poor and anti-freedom. ‘Thee, Ferintosh! O sadly lost! Wha mak the whisky stells their prize! Haud up thy han’, Deil! ance, twice, thrice! Burns returned to the topic of whisky in 1786 with The Author’s Earnest Cry and Prayer – addressed to ‘The Right Honourable and Honourable Scotch Representatives in the House of Commons’. It is a passionate polemic penned for the 45 Scottish representatives in the House of Commons, written in response to the Scotch Distillery Act of 1786, which imposed an extra duty on Scottish spirits exported to England, making it much more difficult for Scottish distillers to do business there. Intrigued by Burns' poems-turned-toasts? Discover the whisky industry's favourite Scottish toasts by Burns and other bards. The world’s best bartenders share their top Scotch whisky cocktail recipes for Burns Night. We celebrate it every year, but how did the Burns Night tradition begin? Celebrate all things Scottish with dinner and a dram at one of these luxurious Burns Night suppers. Haggis, for sure, but what else is needed for the festivities on 25 January? Find out here. From cocktails to whisky flights, get involved in London’s biggest celebration of Scotch.